It's nothing new. Jerry Reinsdorf and Kenny Williams want to win and it's reflected in the moves they make. They may not always succeed in making the right deal or have the resources to get premier players, but they always give it a shot. And it's never been as apparent as this season despite a year dotted with disappointing attendance. In the last five weeks, despite the obstacles, Williams has found ways to acquire a top notch third baseman in Kevin Youkilis, a proven end-of-game reliever in Brett Myers and now, in an effort to bolster the starting pitching, Francisco Liriano. All designed to help hold off the Tigers and Indians. 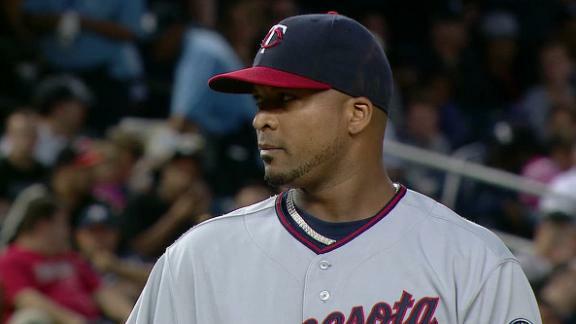 The facts show that the erstwhile Twins lefty has had a rocky season (3-10, 5.31). We saw it first-hand a few days ago when he gave up seven runs to the Sox offense in just 2 2/3 innings. Sure, he's a gamble, but we didn't get Zack Greinke and his high price tag and we needed another starter with Danks a question mark and Gavin Floyd and Philip Humber just returning from injury problems. We also know that Liriano can be untouchable as he was in May a year ago when he no-hit his new team--so in my view the gamble was worth taking. Liriano's addition brings up questions now that the Sox have six starters--Floyd, Humber, Jake Peavy, Chris Sale and Jose Quintana in addition to the newest South Sider. Pitching guru Don Cooper says a six-man rotation is a possibility, an option that would ensure the starters (especially Sale) more rest down the stretch, but nothing has yet been decided. The cost to obtain Liriano was utility infielder Eduardo Escobar, who just happened to collect a pair of doubles and an RBI in the first place Sox's 5-2 victory last night in Texas, and lefty pitcher Pedro Hernandez who didn't quite distinguish himself in his major league debut against the Red Sox a couple of weeks ago. Aside from the loss of Escobar's versatility and popularity in the clubhouse, the Sox are now in need of a backup shortstop. Orlando Hudson can fill in at second and, maybe, third but a backup to Alexei Ramirez is a must. The Tribune's Mark Gonzales mentioned four possibiities: Ray Olmedo, who is batting .273 in 80 games at Charlotte; Drew Garcia, who can fill in at second and short; and Tyler Saladino, now at Birmingham, who was a Robin Ventura favorite in spring training. He also suggested an intriguing choice in '05 Series hero Geoff Blum. Blum, who can play anywhere in the infield, was designated for assignment by the the Diamondbacks last week. With Youkilis, Myers and Liriano, the White Sox are much stronger than they were at the end of June. I don't necessarily expect any more major moves before Tuesday's trade deadline, but when you're dealing with Kenny Williams, there seems like there's always one more surprise.